Mahabalipuram (also known as Mamallapuram), around an hour south of Chennai in Tamil Nadu, is a popular destination for a beach getaway. A number of new resorts have been built there in recent years, providing plenty of options to choose from. Most of them can be found along the East Coast Road to the north of town, where the beach is better. Here's the pick of them! Read More: Mahabalipuram Beach Travel Guide. Newly opened in late 2015 and located on East Coast Road, approximately 13 kilometers (8 miles) before Mahabalipuram, this stylish property is the InterContinental Hotels Group's first luxury resort in India. It quickly impressed guests as well as Outlook Traveller magazine, which named it the Best New Hotel in India in 2016. There are 105 rooms and suites, including some with stunning ocean views and some with disability access. Facilities include three restaurants serving European, Asian and Indian cuisine, a lounge bar, private beach, swimming pool and Ayurvedic spa, and business center. Expect to pay about 10,000 rupees per night upwards for a double, including tax. 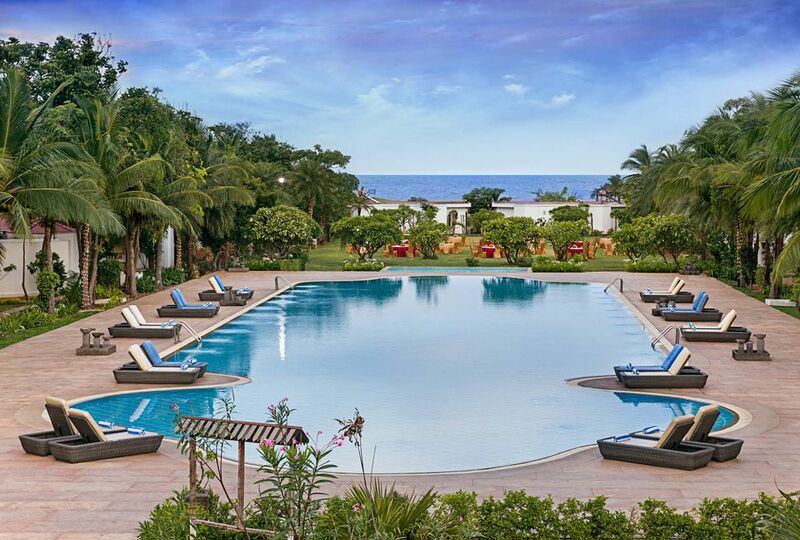 The elegant five-star Radisson Blu Temple Bay Resort is Mahabalipuram's most popular resort. The property is set on expansive 46 acre grounds approximately 10 minutes walk into town. It has its own private beach, as well as an award-winning luxury spa and two swimming pools -- one of which is the longest in Asia. It's possible to walk along the beach from the hotel to the Shore Temple. The hotel was recently revamped and is an extremely attractive property, with a contemporary feel. It has 144 guest rooms. The sea view villas, located only 15 feet away from the shore, are delightfully secluded. Rates start from about 8,500 rupees per night for double, including tax and buffet breakfast. Further north, this brand new five-star ITC Hotels group property is the latest resort to come up on the outskirts of Mahabalipuram. It launched in early 2017 and has proved to be a hit with guests. The resort is spread over nine acres, with an infinity swimming pool overlooking the beach. Accommodations consist of 94 rooms, cottages and villas decorated in minimalist style. Other facilities include indoor and outdoor dining, a bar, and wellness spa. Currently, the resort offers less games and activities than some of the others, making it more suited to a relaxing getaway. Expect to pay 7,500 rupees per night upwards for a double, including tax and an excellent breakfast. The Grande Bay Resort and Spa is set back from the beach not far from the Radisson GRT Temple Bay Resort in Mahabalipuram. It's a modern, architecturally-designed boutique property with 41 super spacious rooms. The spa offers a range of therapeutic treatments including massages, baths, and body wraps and polishes. There's also a restaurant that serves great global cuisine, and a stylish cocktail bar with deck overlooking the ocean and swimming pool. The only drawback is that the resort doesn't front the beach, although it's within walking distance (five minutes or so). Rates start from about 6,500 rupees per night for a double, including tax and breakfast. Around 3.5 kilometers (2.2 miles) north of town, Ideal Beach Resort is an ideal (pardon the pun) hotel for families and large groups. The property is more than 40 years old but has been progressively developed and refurbished over the years. It offers decent mid-range accommodations, with 68 rooms. Facilities include private beach with cafe and hammock, swimming pool, games, and wellness spa. The hotel's restaurant specializes in Indian and Sri Lankan seafood dishes. There are a few potentially negative things to keep in mind though. Availability of alcohol is limited. In addition, the property often gets crowded with people who are attending corporate events or who have purchased day packages. Hence, you may prefer to stay elsewhere if a peaceful experience is important to you. Expect to pay about 6,500 rupees per night upwards for a double, including tax and buffet breakfast. Chariot Beach Resort has a conveniently central spot on a private beach behind the famous Five Rathas monument. The property's expansive elevated grounds provide sweeping sea views, and its huge swimming pool is another standout feature. Other facilities include two restaurants, a bar, wellness spa, games, and an activity village with adventure sports (packages cost extra). Renovation works have been undertaken in recent years but some areas of the property still require updating. In particular, the cheapest rooms in the main hotel building would benefit from a makeover. If you can afford it, it's worth spending the extra money to stay in a poolside cottage. Rates start from about 6,500 rupees per night for a standard double room, including tax. Cottages cost about 10,000 rupees per night upwards, including tax and breakfast.